Police departments across the country know that speed kills and that slowing cars down greatly reduces the number of serious crashes. With shrinking, budgets, it is becoming harder and harder for police agencies to effectively enforce speed limits throughout the city. 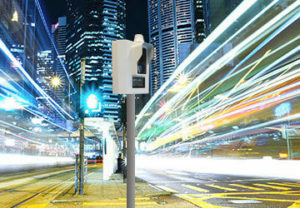 Traffic Logix has developed a new line of Guardian awareness speed cameras that will help police departments to capture real-time images of speeding vehicles and use them to create awareness and issue warnings to prevent violations. They offer valuable data on when, where, and who is causing speeding problems. The Guardian Pro camera is a discreet standalone camera that can be either pole or trailer mounted and used with AC or solar power. Using highly accurate LEDDAR technology, the camera tracks vehicles in multiple lanes simultaneously and is invisible to radar detectors. The cloud based backend of the Guardian Pro lets you create customized warnings from a variety of templates that can be automatically sent to people who violate the speed of your choice. All the data gathered by the camera can be accessed at anyone’s desk or even from police vehicles- anywhere with an internet connection. Speeding is dangerous. We make enforcement easier to help police departments prevent speeding and save lives every day.